More progress has been made with the Infiniti Project Black S since its global debut at the Geneva Motor Show in March 2017. Now on display at the Paris Motor Show, the blacked-out prototype boasts many new developments, including a functional motorsport-oriented cabin. On the outside, the Black S gets revised bodywork (achieved through computational fluid dynamics software for better aerodynamic flow) as well as a newly-designed carbon-fibre rear wing that is said to significantly increase downforce for high-speed stability. 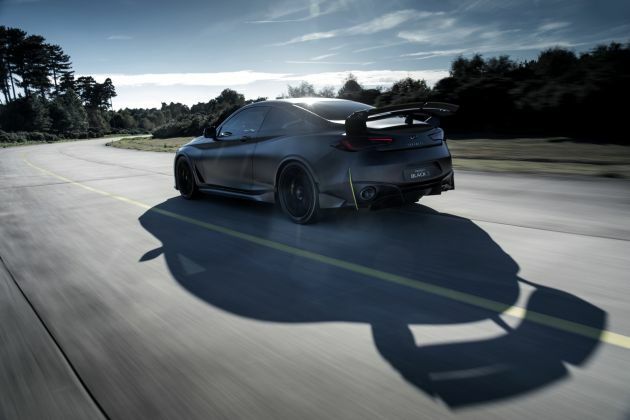 What’s more, the wing’s performance has been validated by aerodynamicists from its partner Renault Sport Formula One Team, so this is no joke. Elsewhere, the body panels, such as the bonnet, fenders and roof, have all been replaced with lightweight carbon-fibre panels. The car also sits on lightweight 21-inch forged aluminium wheels to reduce unsprung mass by a whopping 22 kg, and are shod with Pirelli P Zero road tyres (275/30 front, 295/30 rear). The twin titanium exhaust tips, on the other hand, have been crafted using 3D printing tech. The star of the show here lurks under the bonnet. This prototype employs a F1-inspired hybrid powertrain and receives primary propulsion from a VR30 3.0 litre V6 twin-turbo engine. There are three motor generator units (MGU) that form the Energy Recovery System (ERS) – a single MGU-K (K for kinetic) unit harvests kinetic energy from braking, and two MGU-H (H for heat) motors are fitted to the engine’s twin-turbos to harvest heat energy from exhaust gases. This enables the powertrain to generate electrical power under both braking and acceleration. This is the first of its kind in a road car – Formula One powertrains harvest heat energy from a single turbocharger due to technical regulations. On its own, the petrol engine produces 405 PS/475 Nm, but the dual-hybrid powertrain generates a total system output of 571 PS (torque figure undetermined as yet). With that, the Black S blitzes from a standstill to the 100 km/h mark in under four seconds, thanks in part to its 1,775 kg kerb weight (power-to-weight ratio is around 320 PS per tonne). Drive is exclusively sent to the rear wheels through a seven-speed automatic, and the car comes with three F1-style drive modes, which are Road, Quali and Race. Each drive mode alters the way the powertrain gathers and discharges energy. Electrical energy harvested by the three MGUs is stored in a high-rate discharge 4.4 kWh lithium-ion battery pack, located in the rear compartment. Just like an F1 car, energy recovered and stored by the MGUs is deployed in two ways. Firstly, it acts as an electrically-assisted anti-lag system, ensuring the turbos are spooled and ready for boost when needed. Secondly, energy stored in the battery can be used to power the MGU-K, feeding up to 120 kW of additional electric power directly into the drivetrain. That provides a significant increase in performance, and also for instantaneous, lag-free acceleration. 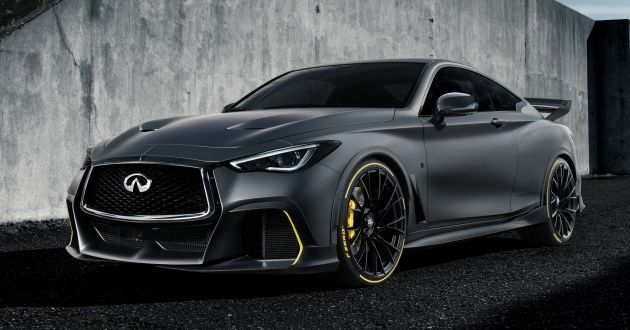 However, the extra electric power is applied to the rear axle through a newly-designed final drive assembly on the rear axle, which integrates the MGU-K.
It’s unclear if the Q60 Project Black S will ever make it to production, but one thing is for sure, Infiniti will be electrifying all models from 2021. In the future, the automaker plans to offer a range of advanced powertrains, including battery electric vehicles and unique e-Power systems for elevated performance and greater pure-electric range. What do you think? Fancy yourself a Q60? Hopefully Infiniti can being this to life, I will definitely consider it. I don’t want it to have the same fate as the Q50 Eau Rouge. RWD again?? urghh. when manufacturers will realized that high performance cars with such torque n hp need 4wd for normal drivers to exploit its power. Learn to drive better then. You want AWD, Audi got you covered. Plus, RWD = awesome burnout.